Real Solutions Home Health Care voluntarily seeks accreditation from leading independent accrediting agencies. It’s one tangible way we demonstrate our commitment to providing home health care services to clients with the highest professional, ethical, and safety standards. Accreditation is a process of review that healthcare organizations participate in to demonstrate the ability to meet predetermined criteria and standards of accreditation established by a professional accrediting agency. Accreditation represents agencies as credible and reputable organizations dedicated to ongoing and continuous compliance with the highest standard of quality. 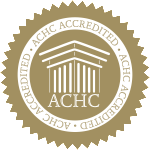 Real Solutions Home Health Care is accredited by Accreditation Commission for Health Care (ACHC), the leading accrediting organization for the home health industry, for voluntarily meeting the industry’s highest nationally recognized standards of care. The rigorous accreditation process involves a thorough examination of the business and service aspects of the entire Real Solutions Home Health Care organization — including office and client visits — in order to evaluate service quality, structural strength, organizational effectiveness, and human and financial resources. ACHC collaborates with industry experts to create standards to ensure that quality is maintained throughout all aspects of the organization.